If you want a high-resolution camera without spending thousands of dollars, we recommend the Perfect Prime IR0018. 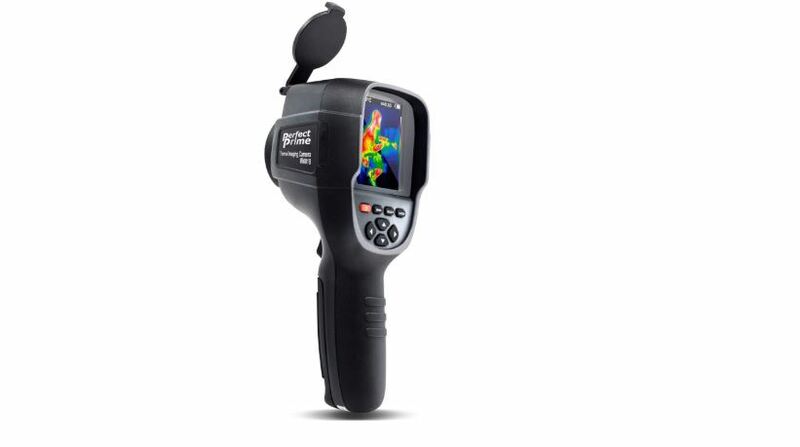 The 220 x 160 camera resolution is one of the highest among thermal cameras in this price range. However, even with the high resolution,don’t expect the same image quality as that from a premium pro thermal camera. The IR0018’s small sensor limits how much detail you can get from the resolution.That’s why we recommend this as an entry-level thermal camera for home inspections and basic professional/industrial applications. If you need a powerful thermal camera for sensitive infrastructural and system inspections, we have some great recommendations in our in-depth thermal camera buying guide. System inspections – HVAC, cooling systems, electrical systems etc. The IR0018 has a surprisingly high resolution for its price. The camera’s 220 x 160 resolution has two big advantages. One, it adds more details to your thermal images. You can spot cold and hot areas more clearly. Two, it increases the camera’s range. Unlike most budget cameras that are only good for short-range inspections, feel free to take the Perfect Prime IR0018 camera outdoors for hunting, exterior wall inspection, roofing maintenance and other long-range applications. But don’t expect high quality thermal images when shooting from a distance. Though the resolution is high, the sensor is not very powerful. The IR0018 can detect temperatures as low as -4°F and as high as 572°F. This is wide enough for most thermal imaging applications including engine maintenance, HVAC repair, electrical system inspections and wall inspections. The sensor’s thermal sensitivity – meaning the minimum temperature difference it can detect –is 0.07°C. This allows the camera to produce a highly detailed image even on scenes with low temperature contrast. This is great if you need to detect a minor leak or defect in a system that is not yet big enough to cause a huge temperature difference from the surrounding. 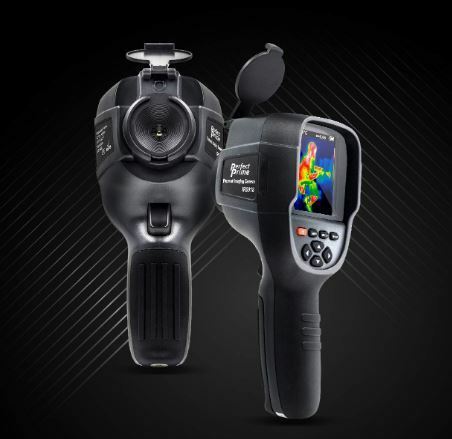 Like most thermal cameras, the Perfect Prime IR0018 can shoot two kinds of images: thermal and visual. It then overlays both images to add detail to the final capture. Instead of just looking at hot and cold spots on a thermal image, you can tell exactly where those spots using the overlaid visual details. This makes it easier and faster to analyze a scene. You can select, on a sliding scale, how much visual detail you want in your thermal image. 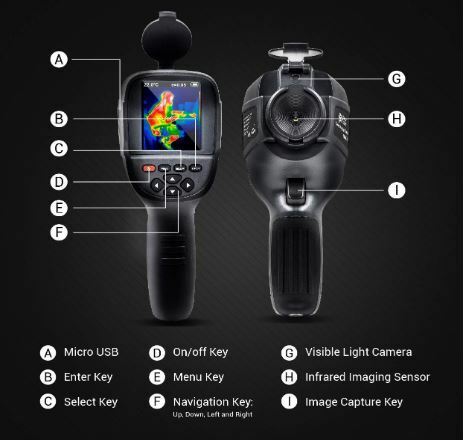 At 100%, you get a complete thermal image. At decrements of 25% - that is, 75%, 50%, 25% - you can add more visual details while tempering the thermal details. At 0%, you get a normal visual image without any thermal details. The camera comes with a 3GB SD card that stores images in JPG format. But you don’t remove the SD card to transfer images. Instead, you use a USB 2.0 cable that is included with the camera. The 3.2” full color display is larger than that of most thermal cameras that cost around the same, giving you more space to analyze images. At full brightness, it provides excellent visibility outdoors. When indoors, you can lower brightness to medium or low. The display is not touch-sensitive. You have to use physical buttons below the screen to navigate the settings menu. But the user interface is well laid out. You won’t have trouble finding the setting you want. With a few clicks of the buttons, you can change display brightness, time, language, temperature display unit (C or F), color palette and emissivity. The IR0018 uses a rechargeable lithium ion battery, which is more convenient than replaceable batteries. A fully charged battery is good for several hours of continuous thermal imaging. With occasional use, it should last several days. To recharge the battery, use the included USB 2.0 cable. Don’t get your expectations too high just because the camera has high resolution. For everyday maintenance and inspection projects at home, the camera is great. It’s better than most budget thermal cameras. But if you are looking for clear and highly detailed thermal images, the IR0018 is not for you. For hobbyists and property owners/managers looking for an affordable high-resolution thermal camera, the Perfect Prime IR0018 is the best choice. The large display screen, high sensitivity and wide temperature range also make it a great entry-level choice for pros. Whether you want to detect moisture in your basement, maintain your clients’ HVAC systems or hunt ghosts, the IR0018 is up to the task.